Like all right-thinking people long accustomed to the sulfurous taste of failure followed by the sweet, sweet ambrosia of success, Les Garagistes are fans of — believe in, identify with — the Boston Red Sox. The confluence of ferment and postseason makes October the most glorious month, and many of our fall sessions are accompanied by the crack of the bat and the roar of the crowd playing on a laptop in a corner of the winery. I for one will never forget, late that wondrous night, sitting at Matt’s and watching David Ortiz plunk a Paul Quantrill pitch into the Yankees bullpen to win Game 4 of the 2004 ALCS, the conclusion of which was not only the most crushing upset in the annals of sport but also one of the greatest events in human history. 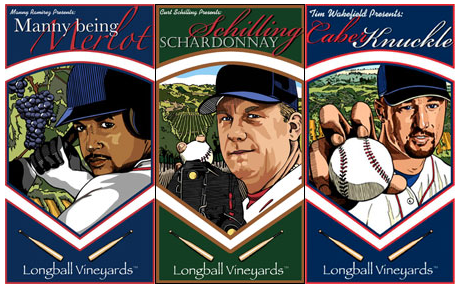 That said, I’m not sure that Longball Vineyards is a great idea. Setting aside the pairing of wine with the national pastime, a dubious proposition especially since the demise of the Montreal Expos signalled the end of major-league baseball in French — ‘lanceurs staring into home plate, frappeurs swinging for the fences and voltigeurs tracking down fly balls at la piste d’avertissement‘ — the choice of varietals is problematic. The ‘CaberKnuckle’ should clearly be Pinot Noir. Tim Wakefield’s signature pitch is the knuckleball, la balle papillon, which makes a slow, lovely and unpredictable dance to the catcher’s mitt. As Willie Stargell said, ‘Throwing a knuckleball for a strike is like throwing a butterfly with hiccups across the street into your neighbor’s mailbox.’ You don’t know how it’s turned out until it’s crossed the plate (or not), and anyone who’s made Pinot Noir knows what that’s like. As for the Schilling Schardonnay, one need only point out that the bloody sock, the holy relic of the 2004 miracle, was red.